About the Cast . . .
Robert Forster (Eddie Miller) achieved worldwide recognition with his first screen appearance, as a withdrawn soldier, in John Huston’s Reflections in a Golden Eye. He then played a hardened TV newsman in Haskell Wexler’s independent classic, Medium Cool, a film that dissected the moral ambivalence of television journalists. He followed that up with supporting roles for a variety of directors, including George Cukor”s Justine. Forster has remarked that his career had “a five year upwards first act and a 25 year sliding second act.” Not that he wasn’t visible for most of that time. Mr. Forster starred in three tv series and a host of small films over the past two decades. He’s worked in a wide range of independent dramas, comedies and action films. If there was a twenty-five year slide, it was reversed when he received an Academy Awardâ nomination for his role as Max Cherry in Quentin Tarantino’s Jackie Brown. Since then he’s been a busy man, offering able support to projects as diverse as the Mamet penned Lakeboat to the Farelly brothers, Me, Myself and Irene, to David Lynch’s upcoming feature, Mulholland Drive. 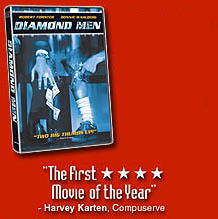 In Diamond Men he plays a salesman on his way out, but a man who is the polar opposite of Willy Loman. He will soon be seen in Rat in the Can, among others. Donnie Wahlberg (Bobbie Walker) skyrocketed to international prominence with New Kids on the Block. Based out of the Boston area, the group went from unknown teenagers one day to pop music stars with the biggest record in the world, the next. One of the first “boy bands” to get world wide acceptance, New Kids went on to sell almost 50 million records, and to play recording dates from New York to Tokyo. Donnie made the transition to the big screen as a reluctant kidnapper in Ron Howard’s Ransom, opposite Mel Gibson. He then went on to play memorable supporting roles in The Sixth Sense, where he shot Bruce Willis, and a tense cable remake of The Taking of Pelham One Two Three where he got shot by the good guys. He has also appeared in a number of independent films, including Southie. In addition to his co-staring role in Diamond Men, Donnie will appear in a key role this fall in the Spielberg-Hanks produced mega miniseries, “Band of Brothers.” In that monster, 10 part, World War II drama, he plays a soldier who sees combat from D-day through the storming of Hitler’s bunker. Bess Armstrong (Katie) has played opposite Tom Selleck (High Road to China), Tom Hanks (Nothing in Common), and Alan Alda in (The Four Seasons). She’s taken roles that range from ingénues to mothers, in over a dozen films for television. She received considerable acclaim as Clare Danes’ mother in the critically revered series “My So Called Life.” She has handled supporting roles in everything from the TV film about the Tailhook Scandal to one of John Waters’ latest, Pecker. In Diamond Men she is the mystery woman who offers the promise of romance, but also danger to Robert Forster’s vulnerable salesman. She is a familiar figure on TV and the movies, most recently completing a string of independent features like Guinevere and Heresay. In Diamond Men she plays a fiesty business woman with a sentimental attachment to Donnie Wahlberg. George Coe (Tip) is a well-known face from movies, television, and the Broadway stage. In the past year Mr. Coe has appeared in four features, including Big Eden and The Omega Code. He will next be seen as Vanessa Redgrave ‘s love interest in A Rumor of Angels. Mr. Coe has played key supporting roles in over 40 feature films, from Dustin Hoffman’s boss in Kramer Vs. Kramer to a scheming husband in The Stepford Wives, to a doomed newlywed in the American remake of Cousins. He originated many roles on and off Broadway, including singing parts in Stephen Sondheim’s “Company” and “Mame.” His television work includes recurring roles in “LA Law” and over a hundred other episodics. In Diamond Men Mr. Coe plays a jeweler with a weakness for a much younger woman.